Coastal Ford Burnaby, Coastal Ford Vancouver and Coastal Ford Squamish are a part of the Carson Automotive Group — a successful automotive brand that has been built on quality service offered up by quality people. Carson Automotive Group started in 1961 on Vancouver Island. Today there are six dealerships on the Island along with its three Lower Mainland operations. Coastal Ford Burnaby opened in May of 1988.There are now 350-plus employees throughout the Carson Automotive Group, with 145 employees split between Coastal Ford Burnaby and Coastal Ford Vancouver. There are many reasons why Coastal Ford has been so successful, but paramount to their success is their long-standing and dedicated employees. “Our customers tell us this is one of the reasons they enjoy doing business with us. 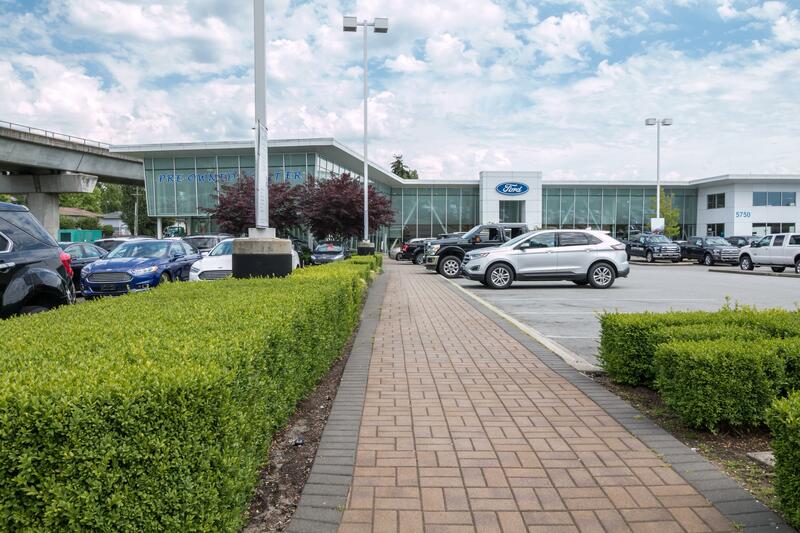 They feel they are building a long term relationship with us when they choose Coastal Ford,” said Dave Michnik, director of sales Lower Mainland operations. “Customers constantly come back and see the same people — service and sales — it’s just more comfortable for the customers. There are lots of good dealerships for customers to choose from, so why choose Coastal Ford? Coastal Ford is committed to the communities in which they serve. They do a lot of charitable work with its biggest supporter being Variety Club: The Children’s Charity for the past 15 years. “Variety Club expands all over the province. Like Coastal Ford dealerships, it affects all the communities in which we serve. It’s very important,” Michnik said. Feed the Children is another charity cause. Every October Coastal Ford collects food throughout the month. It’s just another way that they give back. The Ford Motor Company also funds Drive 4UR School and Drive 4UR Community event program which Coastal Ford is proud to support. “We participate in any where from four to six events per year. This is a test drive program so we take five or six Coastal Ford Vehicles to be driven. Twenty dollars from each test drive goes towards the group hosting the event.” Michnik said. “These events, be they for a school or any other community group, have been widely popular”. Ford of Canada has stated that Canadians have officially named Ford’s F-series the undisputed champion of trucks. For the past seven years, the F-Series has been the top-selling vehicle in the country and for 50 consecutive years, the F-series has been the best-selling pickup in the country. That’s five decades of sales leadership, and a claim that no other vehicle in the country can make. Ford truck owners are passionate, knowledgeable, and know true quality when they see it. Coastal Ford prides itself on a staff that is well-trained on all Ford trucks. When a customer comes into a Coastal Ford dealership they are able to purchase a Ford F-150 with peace of mind with help from the knowledgeable staff. “Our staff will select the right vehicle based on your needs whether it’s for work or recreation”. Before you come down to Coastal Ford to begin your purchase of a Ford F-150, it’s important to do your research first. - Is it for work or for personal? - Is it a weekend vehicle? In keeping with the leadership role Ford has taken on. The all new F-150 Raptor, 2017 Super Duty and 2017 Super Duty Chassis Cab will be in Coastal Ford dealerships this fall. Innovation is what’s behind the high-strength, military-grade, aluminum-alloy that makes the all-new Raptor approximately 500 pounds lighter. The all-new 2017 Super Duty is the toughest, smartest, most capable Ford Super Duty ever, while the all-new 2017 Super Duty Chassis Cab is the ultimate in upfitting. With more towing, more payload and higher GCWR, it’s the most capable Super Duty ever. The Mustang is a classic car and an iconic brand for Ford. But ranging in price from $20,000 to $100,000, how do you make the right choice? He noted that the new Mustang appeals to both the modern customer and traditional driver. “We are sponsors of the Greater Vancouver Mustang Association and we see the 50-year-old guys who had the classic Mustang as kids and then life caught up. With the family, the kids, and job changes all in the past, now they have come back to Mustang.” These buyers appreciate the classic feel of these 21st Century pony cars, which are comfortable to drive, have all the modern amenities, and offer a wide model range. Model wise, the iconic Mustang was the game changer for Ford. The brand started in 1964 and was originally conceived to target a female driver. During the past half-century, the brand certainly has experienced many changes and with the latest 2016 model, Mustang sales have skyrocketed. “In the general conversation Mustang is the key, not the prices per say. People, when they see the car, don’t know whether it is $20,000 or $80,000, but when you say Mustang, you know the car instantly. Lease versus finance: what’s best for you and why? These are big questions when you are looking to purchase a vehicle. Coastal Ford believes that, while leasing and financing both feature broad similarities, including being able to negotiate everything from monthly payments and down payments to interest rates, everything else differs greatly. Even though the cost of the vehicle is the same the differences between financing and leasing have to be carefully considered. When financing, the entire cost of the vehicle, including all the taxes, delivery and fees, is spread out over your desired number of months. Generally, the longer the term, the smaller the payments, and interest rates offered are generally lower. With financing, the payments will eventually end, leaving you as the full owner with the freedom to do what you want with the car or truck. When leasing, the term is usually much shorter —say two to three years — and the factory will figure out what it thinks the vehicle will be worth at the end of the term given its condition, equipment, mileage and more. This is known as ‘residual value’. Also with leasing you do not pay the tax upfront. The amount between the total sale price and the predicted residual value (i.e. the depreciation) is what’s used to calculate the monthly payments. Because the amount of money you’re borrowing is less than when financing, your monthly payments are often much lower. If you are planning on paying for a new vehicle with an option besides cash up front, one question to ask is how long you should stretch out the payments? Because leasing generally offers smaller monthly payments, it means you can ‘afford’ a nicer vehicle for about the same monthly payment. “I think given the opportunity to go lease or finance, we will present the detail and options and let the customer decide,” said Dave Michnik, director of sales Lower Mainland operations. “Ultimately this is an individuals’ decision. It is not our decision.” He added that every client is different, with some preferring to have the vehicle for a long term, meaning it’s not important for him or her to have the ‘latest and greatest’.